Let me share with you four ways how to overcome ad blocker detection. . In other words, how to view websites which blocked you with a ad-blocking message, to prevent you from reading their content. Here are four definitely-worked methods to make your ad-blocker invisible to sites that require you to disable your ad blocker. When you visit certain sites, you may come across a big banner blocking or stopping you from viewing their sites, because they detected you have installed an ad blocker like, AdBlocker ULTIMATE on your web browser. On that banner, it says something like: "Welcome! It looks like you you're using an ad blocker. That's okay? Who doesn't? But without advertising-income, we can't keep making this site awesome." Then followed by a button where you can click that reads: "I understand, I have disable my ad blocker. Let me in." Of course they want you to click on that button to disable your ad blocker. Then only you are allow to access into their sites. Don't worry, ad blocker users. You can still access those "unwelcome" sites, without having to disable your ad blocker. Keep your ad blocker on and I would show you three methods how to get around those blocked websites, so you can keep viewing their sites. From my own experience, I tried to access the article "That Viral Photo Of Theresa May With The Scream Painting Is Totally Fake" at Gizmodo. And I encountered this notice (as shown below) stopping me from reading the article because I am using AdBlocker Ultimate. To be able to read the article, without having to whitelist the site or disable my adblocker, this is what I do. I just clicked on the "Reader View" icon (symbol of an opened book), which is located at the address bar. It is just above that article. To be precise it is next to the "Reload current page" icon aka refresh button (symbol of a circular arrow). Once you hover cursor over the icon (instantly it changes from grey color to blue), it followed with the remark: "Enter Reader View". You just click on it. And you can read the article right away. Note: With Reader View mode, some of the accompanying images/pictures will not appeared. In order to view the article as it is (with all the images), you click on the "Reader View" icon again. This time when you hover your cursor over the orange color icon (it will instantly change to blue), together with the remark:"Close Reader View". Now you can read the article without any ad and fuss. 1. If you still don't have this Firefox ad-on or extension called "Greasemonkey", then do it now. 3. Click on the green color button "+ Add to Firefox". 4. After it has finished downloading, click on the "Install" button. 5. Then click on the "Restart Now" button. 6. It will close the Firefox browser for a while, and then it will open back. 7. You should see the small monkey head icon on top of the right hand corner of the page. 1. 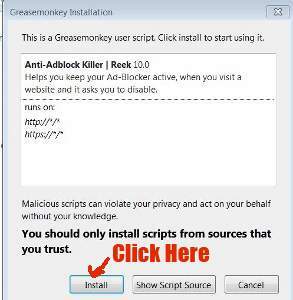 Click on Greasy Fork to install Anti-Adblock Killer script. 3. Click on the "Install" button. Now you can access those sites that tried to stop you from viewing because you are using ad blocker to hide ads. Take note: The above method may not work for some websites. From my own experience, with the above method, I still cannot access the site Newser. In order to fix the blocking problem, I used the method as mentioned below. 1. Open your Firefox browser window or tab. 4. Next you click the blue button: "I accept the risk!" Now go to the blocked page again to reload the page by clicking on the "Reload current page" icon in the address bar of that page. Now the Adblocker detected message over the page should disappeared now. You should be able to access the blocked page. 1. Click on "View" at the menu bar which is right at top of your computer screen. 2. A menu will drop down. 3. Scroll down your cursor to "Page Style". 4. 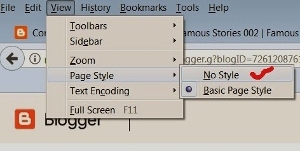 Then slide your cursor over to "No Style" and click on it. 5. Now reload the blocked page. 6. You should be able to access or view the blocked page now! The other day I came across a site which detected my ad-blocker. I did not turn off my ad blocker, and I tried to read the article with Method One (via Reader View) and the Fourth Method (via No Style) as explained above. 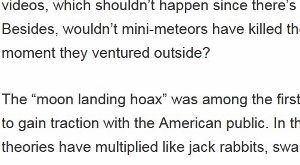 With these two methods, I can only read the first paragraph of the article. 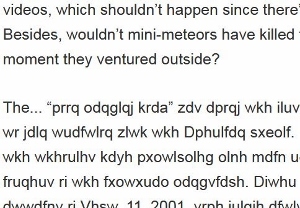 The rest of the content of the article is written in gibberish text, as shown below. By the way, here is another tutorial on how to bypass those no-right click copy protected sites.